Glove boxes, or gloveboxes, are a sealed container used to manipulate objects in another environment. 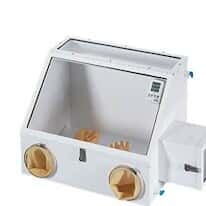 A glove box is ideal for protecting workers in applications that involve handling hazardous material or manipulating substances that require a controlled environment. Choose from inflatable glove bags, basic glove boxes, controlled atmosphere glove boxes, or biohazard and multihazard glove boxes.